Rick Cresta, a clinical social worker and professor at Boston University's School of Social Work, spoke about the confusion surrounding marijuana and it's use. More than 75 people attended the event Wednesday night at Lenox Memorial Middle and High School. Laws regarding the sale and use of marijuana vary across the country. The issue of the drug’s use among teens was the topic of a talk in Lenox, Massachusetts Wednesday. While Colorado and Washington allow the recreational use of marijuana and states like Massachusetts have legalized the drug for medicinal purposes, the federal government considers it a Schedule I drug. That puts it in the same category as drugs like heroin. The legal uncertainty creates confusion for teens according to a countywide study cited by Lenox Public Schools superintendent Edward Costa. 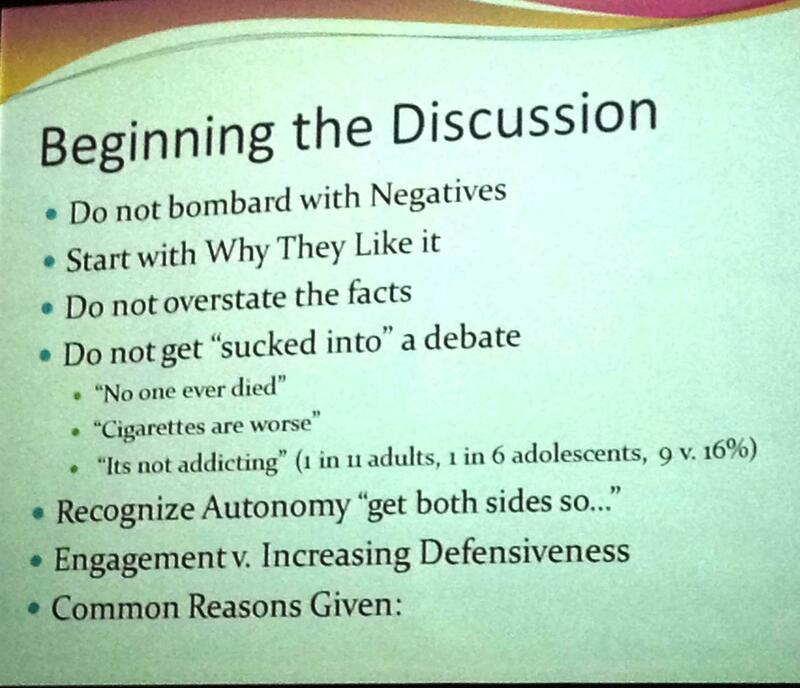 The study was discussed at a forum Wednesday night that drew more than 75 parents and students. The event’s guest speaker was Rick Cresta, a clinical social worker and professor at the Boston University School of Social Work. “My point of agreement is marijuana, and I believe this, may cause less harm than all other drugs including alcohol, but that does not mean it’s harmless,” said Cresta. Cresta says because of its federal classification, it’s very difficult to get funding to study the effects of marijuana in the United States. Most of the findings come from foreign countries. Cresta says the legality question and the uncertainty of the drug’s effects cause confusion for parents as well as their teens. 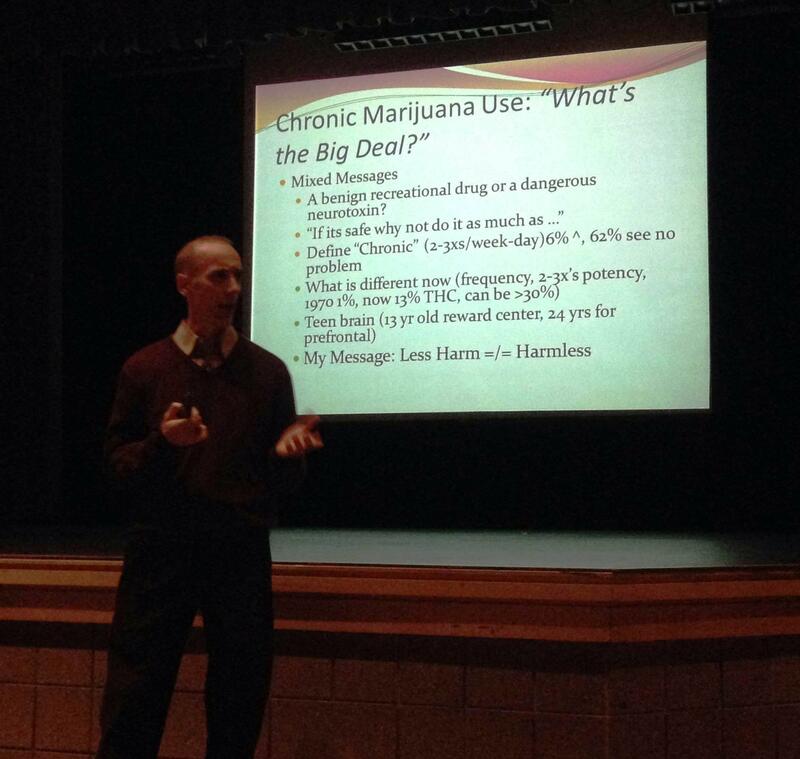 Cresta’s talk focused on preventing teens from chronic marijuana usage, defined as little as 2-3 times a week. He says studies have shown that until age 24, the brain is still developing and the compound THC found in marijuana damages the prefrontal cortex which supports long-term planning, problem-solving and emotional stability. Cresta says with potential medical benefits, indirect negative impacts and a public view that is acceptingly undecided, marijuana is different than most other substances. Rich Woller is the father of a Lenox senior. Elias Williams is a freshman at Lenox. He says the perception of marijuana as being less dangerous than other drugs has led to increased use among teens. The Massachusetts Department of Public Health awarded provisional licenses to 20 medical marijuana dispensaries in February. The 2012 voter-approved law allows for a maximum of 35 dispensaries statewide with at least one in each of the commonwealth’s 14 counties. When it comes to legalizing marijuana, things are moving quickly, especially in New York. Last Friday, the federal government released guidelines for banks to conduct business with the $1.5-billion-a-year legal marijuana industry. Medical marijuana is now legal in 20 states, and legislation is pending in 13 others. The green signal may have been sent in January when President Barack Obama told The New Yorker that marijuana was less dangerous than alcohol, opening the door for debate. College of Saint Rose alumna Alyson Martin and Nushin Rashidian, investigative journalists and authors of a groundbreaking book on the movement toward legalization of marijuana, will read from their new book, A New Leaf: The End of Cannabis Prohibition, as part of the 2014 Frequency North writers series at The College of Saint Rose on Thursday February 6th. In November 2012, voters in Colorado and Washington passed landmark measures to legalize the production and sale of cannabis for social use—a first not only in the United States but also the world. Medical cannabis is now legal in twenty states and Washington, D.C., and more than one million Americans have turned to it in place of conventional pharmaceuticals. Yet the federal government refuses to acknowledge these broader societal shifts and continues to raid and arrest people: 49.5 percent of all drug-related arrests involve the sale, manufacture, or possession of cannabis. Next In NYS: Legal Marijuana? A bill that would legalize recreational marijuana in New York State was introduced last week. The measure would regulate the sale of pot and tax it, treating it similarly to alcohol. Proponents are cautiously optimistic that the governor might see the plan in a favorable light. Residents in Pittsfield, Massachusetts have heard from members of an organization looking to open a medical marijuana dispensary in the city. Nial DeMena is the Director of Operations for Manna Wellness. “We’re looking to be the first LEED-certified registered marijuana dispensary in the country,” said DeMena. Today's panelists are WAMC’s Alan Chartock, WAMC’s Associate News Producer, Patrick Donges, and the Producer of The Roundtable – Sarah LaDuke. Ray Graf moderates. A state lawmaker reviewing the selection of operators of medical marijuana dispensaries says the state agency overseeing the process should reconsider some highly-rated proposals that were not approved for provisional licenses. While I was on the phone with a colleague from Denver last week, our conversation turned inevitably to the topic of marijuana. Colorado legalized recreational use of drug via popular referendum in 2012, creating the world's first fully regulated recreational marijuana market. The first commercial sales occurred this past January, with $15 million in sales reported in the first month alone. Massachusetts Governor Deval Patrick says he does not believe the process of selecting medical marijuana dispensaries should start again from scratch. Patrick told reporters on Monday that none of the 20 applicants approved so far have been granted licenses to operate dispensaries and won't be until they verify all the information they provided in their applications. Massachusetts health officials have granted 20 licenses for medical marijuana dispensaries in the state. WEST HAVEN, Conn. (AP) — Connecticut officials have selected the first producers of medical marijuana, saying the move will benefit seriously ill patients while safeguards will prevent abuses. Gov. Dannel P. Malloy and other officials announced the selection Tuesday of four producers who will operate facilities in West Haven, Portland, Simsbury and Watertown.